The Black Hornet drone feels like a movie prop. Roughly the size and weight of a sparrow, the robotic scout helicopter has already seen use with British special forces. 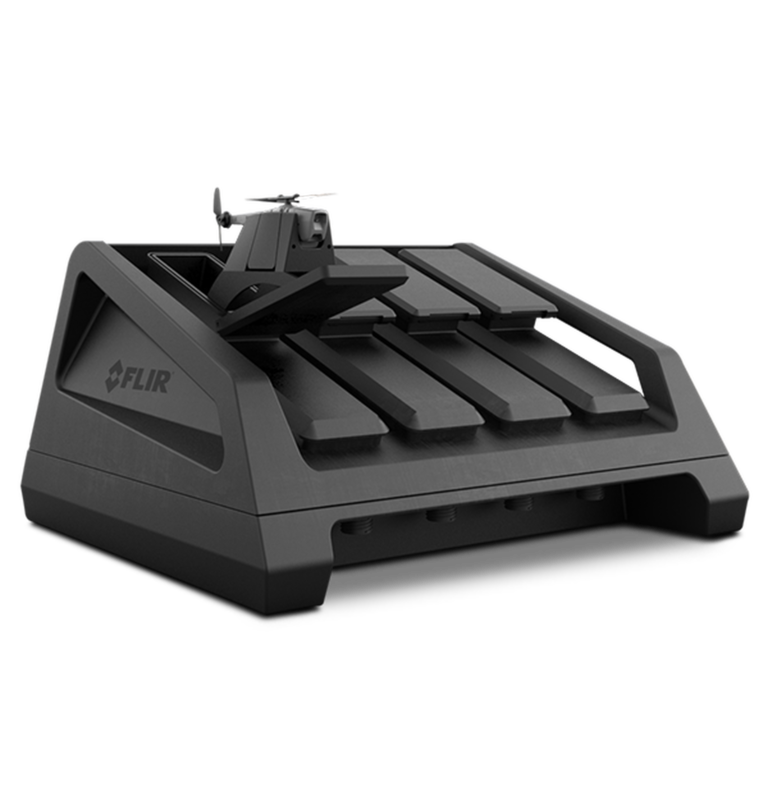 At the 2018 Association of the United States Army exposition in Washington, D.C., Black Hornet-maker FLIR showed off the latest way to carry the drone into combat: a miniature hanger for four drones, roughly the size of a large breadbox. It’s called the Vehicle Reconnaissance System. Once a cassette flips up and the drone is ready for launch, the controller will look for a GPS signal. If it fails to find a GPS signal, the Black Hornet will stop preparing to fly and retract back into the safety of its little hangar. (Alternatively, a human pilot can set the drone to operate under direct fly-by-video control and command it directly, without the GPS assist). Using GPS, the drones can fly a way-point path drawn out by a human operator, or be steered directly by the human pilot. With two radio channels, the system can accommodate two drones flying at once, with either one human watching on a split screen or two separate pilots steering the bird-sized drones. The drones have a range of 1.25 miles, can fly for up to 25 minutes, and top out at a speed of around 13 mph. When not flying, the drones can recharge in their heated cassettes, and should the chargers be damaged or for some reason no longer needed, they can be replaced, slotting a new drone and charger into the old bay. Putting a box of robots on a tank, or a personnel carrier, or even another robot is more about adding a capability than it is about reducing the existing labor needs of the machine in question. Yet that potential gained is great ― flying ahead, looking over a hill or around a building or through a dense cluster of trees means a chance to see new information, spot an ambush, catch a foe unawares. It also points to a future where drones are a feature that can be added to other vehicles. With greater automation and image processing, the little human-piloted scout robot could become an ambient surveillance capability, rotating shifts of drones flying preset patrols around the fixed point of the vehicle, landing and recharged to ensure persistence coverage. Those steps are years ahead at a minimum. For now, the Black Hornet VRS is a box of robots that can go on a tank or another robot.